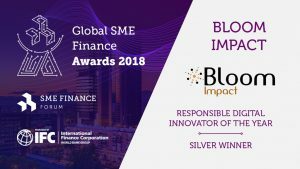 Bloom Impact is pleased to announce that it has been awarded the Responsible Digital Innovator of the Year Silver Award at the IFC’s SME Finance Forum which took place from the 5-7 November 2018 in Madrid. The award was given to Bloom Impact for our data-driven marketplace that empowers small business owners to learn about and easily & affordably access financial services. Our mobile App uses machine learning, data analytics and a scoring algorithm to analyse needs, eligibility and suitability of SME’s and match them with the most suitable products. Our solution allows us to reach a wide range of small business owners that suffer from lack of adequate and affordable access to financial products. We provide financial education, tools, credit reports and guidance to ensure responsible borrowing, savings behavior and smart business usage of payment accounts. 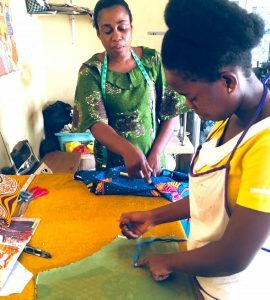 With over 40 products and multiple bank partners on our marketplace platform we have been able to serve thousands of unbanked and underserved Youth, Women and other growing small businesses.